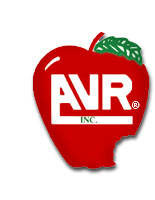 At AVR, Inc. our number one goal is to provide you with friendly and knowledgeable customer service. Our motto is Promises Made, Promises Delivered. For over 40 years, we have been providing excellent service and delivering on our promises to you the customer. We have two dispatch offices to serve you. The AVR, Inc. dispatch office is located in Apple Valley while the AME Red-E-Mix, Inc. office is located in Elk River. 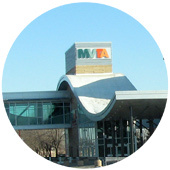 AVR, Inc. services the main metro area of Minneapolis and St Paul. The dispatch office is located in Apple Valley, MN. 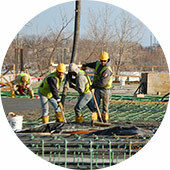 Our AME Red-E-Mix, Inc. affiliate is headquartered in Elk River, MN. 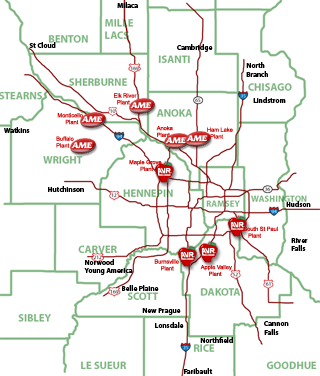 AME plants serve the north and west suburbs of the metro area. ** Saturday hours start in early Spring and run through late Fall. Our normal hours of delivery are from 7:00am through 4:00pm Monday through Friday. 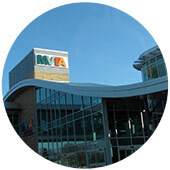 Beginning in Spring, depending on weather and business demand, we will open on Saturdays from 7am through noon. Our Saturday delivery schedule normally goes until the start of bad weather in late October or later. Make sure you call ahead in early Spring and late Fall to check on the schedule. Earlier and later times are available Monday through Friday with notice. Additional charges may apply. Ordering concrete for the first time can be a little difficult. Spend some time here if you have questions about concrete or feel free to call our dispatch team at AVR and AME if you prefer live answers. 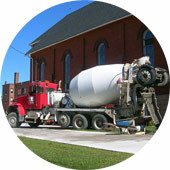 How much concrete does your project require? We have provided a Concrete Calculator 'Quick Tool' located on the right toolbar to help you estimate the amount of concrete needed for your project. Make sure to allow extra for uneven sub grades and spillage, and then round up to the closest 1/4 yard. Our trucks haul approximately ten (10) cubic yards per delivery when fully loaded, so remember that smaller loads often have extra delivery charges... as a result it is usually cheaper to order just a little extra rather than run the risk of running short and having to pay additional delivery charges for the balance load. Make sure you are ready when the truck arrives. We charge extra for longer deliveries (in excess of 7 minutes per yd), so it is important to have enough help and be ready. We try our best to get as close to your desired delivery time as we can. We're usually within fifteen to thirty minutes of the requested time. 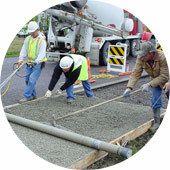 Time and temperature affect the performance and ability to pour the concrete from the truck, so please understand the need for an organized job. 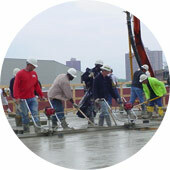 Using our Quality Concrete will help produce a quality result. Our trucks are big vehicles (see the Truck Specs section below), often weighing up to 80,000 lbs when fully loaded. We try not to leave the street and curb line unless absolutely necessary and then only with your permission. Carefully plan how the truck can access the job. Electrical overhead wires and trees and a narrow driveway can make the process very difficult. Soft terrain or landscaped yards also present a real problem when an 80,000 lb vehicle tracks across it. Think Safe! Be Safe! Each spring thoughout Minnesota, roads are posted due to spring thaw. This could pose a problem for delivery. If posted, at best we will be forced to haul smaller loads requiring additional delivery charges. Some will be posted to a point that delivery is not possible. Talking to our dispatchers can be a big help with any of these questions. Overworking the mix is also a problem that creates issues for our products. 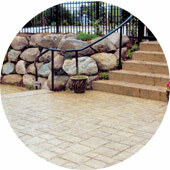 The easier concrete can be placed and worked, the better the long-term durability. There are retarding chemicals that can slow the set if you need more time and there are accelerating chemicals that can speed it in the cold. These are all issues you should consider before ordering. Water is concrete's worst enemy when it is first mixed. Adding water past the normal designed amount can reduce nearly all the strength and wear potentials of the mix. We have other products called super plasticizers that can give you more workability without the damage that water can bring to the mix. Delivery schedules can fill up fast. It works best to place order 1-2 days in advance although we will try to accomodate same day orders. AVR, Inc's friendly dispatchers can help you determine the proper mix and slump based on your project type. Make sure to double check your figures and always order 10% extra concrete to compensate for settling, an uneven sub-base, and spillage. Then round your order up to the nearest 1/4 yard. If your project needs more than one truck load, you will need to determine how long it will take you to unload each truck. 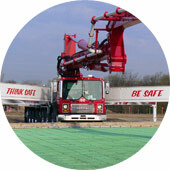 Dispatch can help if you let them know how you are planning to place the concrete. A 'GO' order means that a truck will deliver your order at the specified time. If you have to cancel, you need to let dispatch know at least 1 hour before your delivery time. A 'WILL-CALL' order means that a delivery time has been scheduled for your order. You must call to confirm at least two hours before your scheduled delivery time or a truck will not be sent. Ever wonder how big those concrete trucks really are? Well here are some specs you will want to keep in mind when ordering concrete, to ensure AVR's trucks will fit on your site. Weight (with 10 yard load): 72,500 lbs.